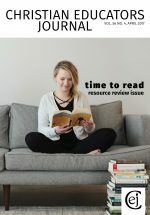 For this issue of CEJ, we asked our panelists either to talk about a recent book they have read and its helpfulness as a Christian educator or to discuss other types of media (podcasts, blogs, newsletters, journals, etc.) they use for ideas, inspiration, and engagement with the work of Christian education. Books: Leaders of Their Own Learning, written by Ron Berger, Leah Rugen, and Libby Woodfin, continues to be a pivotal text for Christian schools in Ontario as we keep pushing for student engagement. Responsive Classroom, an organization with a number of training resources, has captivated us with their special approach to teaching that connects academic success with social and emotional learning. We’re tapping into Responsive Classroom’s resources, such as The First Six Weeks of School and The Morning Meeting Book. Another text I’m excited to read is Humanizing the Education Machine by Rex Miller, Bill Latham, and Brian Cahill. The principal here at Hamilton District Christian High School, Nathan Siebenga, was personally involved in this book, and Rex Miller has participated in past Christian Deeper Learning networking meetings. Curt Thompson, our keynote speaker for next fall’s convention, has written Anatomy of the Soul and The Soul of Shame, which make powerful connections between interpersonal neurobiology (IPNB) and spiritual formation. He explores what it means “to know as we are known” in both our personal narratives and the larger drama of Scripture. Podcasts: The TED Radio Hour, hosted by Guy Raz on NPR, is an entertaining way of accessing multiple TED Talks linked by common themes in a single episode. My favorite episode is “How It All Began.” Is anyone exploring the use of Big History in their schools? I also appreciated the short podcast series by Malcolm Gladwell called Revisionist History. And finally, for the English teachers out there, I love listening to the stories on Snap Judgment. Other sources: I’ll highlight two other sources that inspire me. The first is an amazing network of Christian educators with whom I share ideas and resources constantly. This professional learning network uses Twitter to bring some of the best thinking in education right to my computer. Resources include items from the Buck Institute for Education, Edutopia, and others. Second, we’ve done in-person visits at schools that model our vision. Our visits to an Expeditionary Learning (EL) school in Rochester, NY—Genesee Community Charter School—connected us to Responsive Classroom, for instance. Justin, thank you for your recommendations! Here are some resources I use to stay informed about current educational research and trends, effective teaching practices, and issues that affect students. I always look forward to reading Educational Leadership, published by the Association for Supervision and Curriculum Development (ASCD). This monthly magazine focuses on a specific topic related to education and approaches it from a variety of perspectives. The easy-to-read articles often include strategies for effective teaching, ideas to engage students in learning, and new understandings of the affective needs of students. I am often inspired to implement a new idea or strategy into my teaching after reading one of these issues. Because I have a subscription to Educational Leadership, I receive a daily e-mail from ASCD (ASCD SmartBrief) that includes twelve to fifteen brief articles related to education. This connects me to a variety of current articles related to teaching, learning, and leading in a school setting. I lead and take part in several professional learning communities in our school that focus on academic book discussions. These not only build community with colleagues but also keep us accountable for the teaching and learning we engage in each day. My coworkers and I learn from each other as we strive to share our faith in our classrooms and through our teaching. I often read Inallthings.org, a project from the Andreas Center at Dordt College. This online discussion forum features Christians who share their own ideas about living out faith in a genuine, Christ-like way. And of course, I read Christian Educators Journal! I appreciate the wisdom shared by various Christian teachers who keep the rest of us on track in our teaching. ix Thinking Hats by Edward de Bono. I experienced this book before reading it! The facilitator at a retreat I attended in the fall used the methodology described in the book to lead the group through a very sensitive discussion. Our discussion was guided using the Six Hats system, and it was much richer than I could have anticipated: a healthy discussion, diverse voices, real issues, and an overall productive and positive end result. Since that time, I’ve read the book and used the process myself when leading a group through a challenging issue. Very worthwhile. The Marshall Memo. A colleague recently recommended this educational research newsletter for those who want to stay up to date with the latest ideas and research but who don’t have time to read everything. This newsletter is like having your own personal research assistant. The Marshall Memo is designed to keep educators well informed on current research and best practices. Kim Marshall lightens the load of busy educators by serving as their “designated reader.” Marshall reads over fifty publications, looks through each week’s articles, and selects five to ten most likely to positively affect the readers. If you sign up (fifty dollars annually), you will receive weekly e-mail updates, which include Marshall’s summary of each article, a link to the full article (if available), and salient quotations from the articles. Although new to this resource, I’m impressed so far with the selection of articles and the diversity of the publications highlighted. It helps me stay somewhat abreast with what happens in the education world without spending hours reading and researching. I would like to recommend two podcasts and one Internet site that I have employed in my teaching lately. The first podcast is Backstory (http://backstoryradio.org/). With nearly ten years of archived shows, Backstory examines one topic in American history across the eighteenth, nineteenth, and twentieth centuries. When I rewrote my United States history curriculum with a thematic emphasis, this podcast became a very important resource. The second podcast is Intelligence Square Debates (http://www.intelligencesquaredus.org/). This podcast, too, has a deep archive of shows covering a variety of topics. I recently assigned my class a podcast featuring a debate about undocumented immigrants and whether they should be given a path to citizenship. Students listened to the show, filled out a chart on each debater’s position, and then recreated a shortened version of the debate in class. My final recommendation, a website called Room for Debate (http://www.nytimes.com/roomfordebate), features debates on a variety of contemporary topics. Each topic is approached by a number of commentators from across the political spectrum. Two debates I’ve used in class have been “Hating Woodrow Wilson” and “Americans and Their Flag,” which is about the San Francisco 49ers quarterback, Colin Kaepernick, and his recent refusal to stand during the national anthem. Thank you, panelists, for sharing these resources. I think we all realize the importance of staying engaged with colleagues in our field, learning from new and relevant research, seeking out new teaching resources and instructional strategies, and finding ways to remain inspired and fresh. However, we also realize that time is limited, and our days are already filled with urgent and essential matters. Our hope is that some of the resources highlighted here will spark your interest and be accessible and helpful to you in your work as a Christian educator. Backstory. A program of Virginia Foundation for the Humanities, http://backstoryradio.org/. Berger, Ron, Leah Rugen, and Libby Woodfin. Leaders of Their Own Learning. Jossey Bass, 2014. Buck Institute for Education, https://www.bie.org/. De Bono, Edward. Six Thinking Hats. Bay Back Books, [rev. ed.] 1999. Educational Leadership. A publication of the Association for Supervision and Curriculum Development, http://www.ascd.org/publications/educational-leadership.aspx. Edutopia. A publication of the George Lucas Educational Foundation, https://www.edutopia.org/. “How It All Began.” TED Radio Hour, http://www.npr.org/programs/ted-radio-hour/357837221/how-it-all-began. In All Things. A publication of the Andreas Center at Dordt College, inallthings.org. Intelligence Square Debates. Intelligence Squared US, http://www.intelligencesquaredus.org/. The Marshall Memo. A publication of Marshall Memo LLC, https://www.marshallmemo.com/. Miller, Rex, Bill Latham, and Brian Cahill. Humanizing the Education Machine. Wiley, 2016. Revisionist History. A program of The Slate Group, http://revisionisthistory.com/. Room for Debate. “Americans and Their Flag,” http://www .nytimes.com/roomfordebate. —. “Hating Woodrow Wilson,” http://www.nytimes.com/roomfordebate. Snap Judgment. A publication of Snap Judgment, LLC. NPR, http://snapjudgment.org/. Thompson, Curt. Anatomy of the Soul. Tyndale Momentum, 2010. —. The Soul of Shame. InterVarsity, 2015. Christian Altena, who teaches at Chicago Christian High School in Palos Heights, Illinois. Justin Cook, who serves as the Director of Learning at the Ontario Alliance of Christian Schools in Ancaster, Ontario. Rebecca DeSmith, who serves as Discovery Program coordinator and teacher at Sioux Center Christian School. Gayle Monsma, who serves as the Executive Director for The Prairie Centre for Christian Education in Edmonton, Alberta. John Walcott, who is assistant professor in the education department at Calvin College.